Remember the day you spotted your first gray hair-and the flood of emotions that followed? First, denial. Maybe it’s a blonde highlight-even though I’m not blonde....Then anger: What the-?! I’m too young for this. Finally, acceptance. Either these streaks add character; I like ’em or meet me in the hair color aisle! 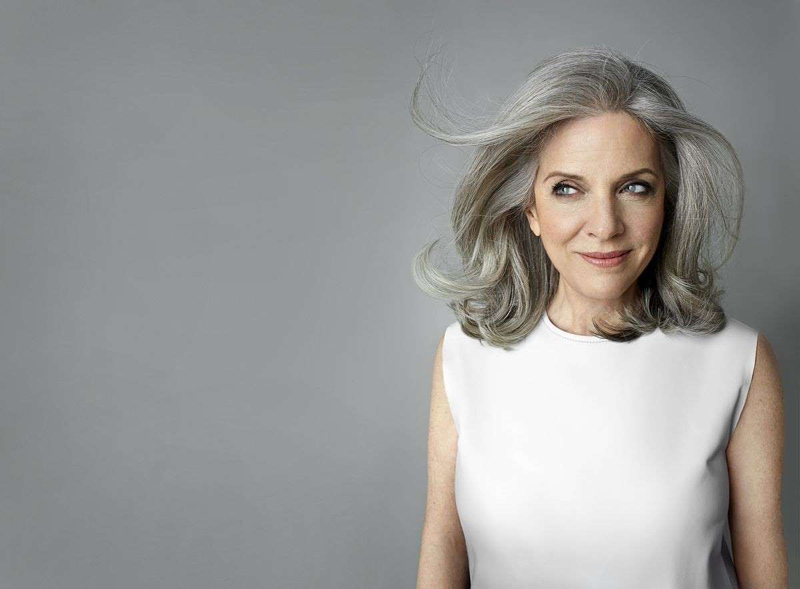 Here’s the silver lining: We’ve got pro-approved plans, based on questions submitted by O readers, to keep you looking your best whether your gray is do or dye. 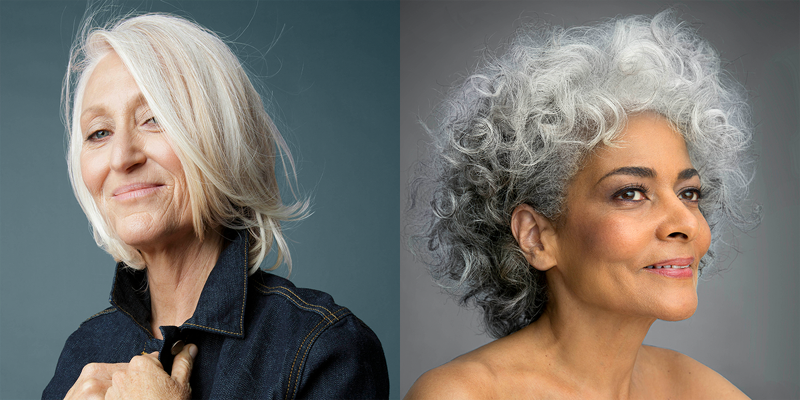 © ARI MICHELSON Hairstylists and makeup artists answer our readers’ top questions on gray hair, from what causes them in the first place to how to make the transition. I've just started seeing grays, but don't want to begin coloring my hair yet. How can I make salt-and-pepper work? This look is best on brown or black hair, Jet Rhys, a celebrity colorist and salon co-owner, says. That’s because it all comes down to the contrast of dark and light. So brunettes, when your grays first start sprouting, they’re rarely evenly dispersed throughout your hair; you may end up with a few streaks here and there. To get a more even look, consider a temporary color-depositing spray, compact, or mousse like Rita Hazan True Color Ultimate Shine Gloss. “It won’t completely cover the grays, but it will camouflage them, which makes patchiness less visible,” Gaby Miley, a salon owner and global artist at Redken 5th Avenue NYC, says. “And keep your overall look youthful and current with a stylish cut,” Rhys says. Your follicles stop producing pigment. This happens naturally with age, but genetics can trigger the process sooner (thanks Mom and Dad). In fact, researchers have identified a specific gene, called IRF4, responsible for graying. 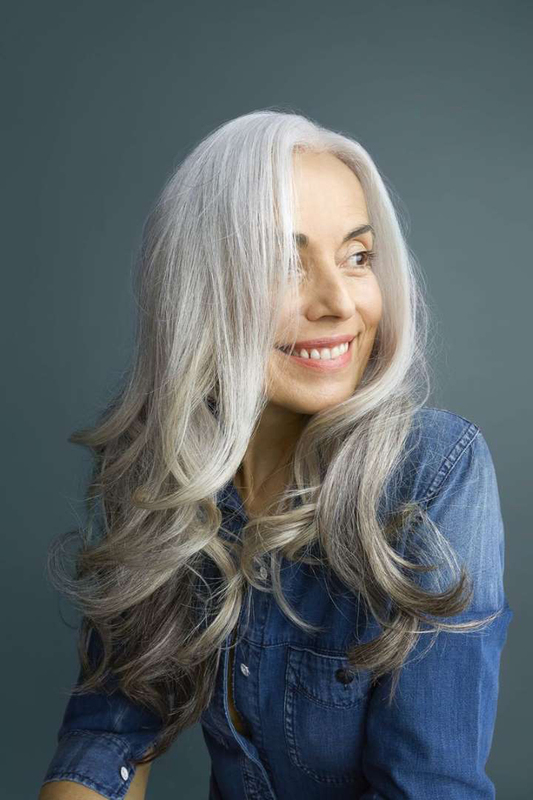 Other factors that can have you seeing gray include stress and diet (studies have linked a lack of B vitamins to early graying), says Melissa Piliang, MD, a dermatologist who specializes in hair at the Cleveland Clinic. Try a layered collarbone-length chop, and smooth your hair by blowing it out with a round brush or defining your waves or curls with a curling iron. If your grays are coming in coarse and sticking up straight along your hairline, apply a cream or softening balm like SheaMoisture Argan Oil & Almond Milk Smooth & Tame Blow Out Créme to those areas and blow-dry with a boar-bristle brush. What's the best coloring plan if you're not ready to go gray? First off, don’t pluck! All that tugging can damage your follicles, and eventually, you may be plucking your entire head. Now, if you’re a DIY dyer, rule number one is simple: Read the box. “Don’t just look at the picture,” says Miley. Not all at-home dyes are created equal, especially when it comes to gray coverage. Somewhere on the box it should say that the formula covers gray. Look for a permanent dye like Garnier Nutrisse Ultra Color, which grows out in four to six weeks, as opposed to semi-and demi-permanent shades, which fade after 28 shampoos or so. Application is important, too. Rhys recommends finding your strongest patch of gray and using the brush to paint on the color there first. The rough texture of grays can make them more resistant to dye, so you want the formula to sit on those strands the longest. “It’s okay to leave dye on stubborn grays for ten minutes longer than the instructions indicate,” Rhys says. If you go to the salon, tell your colorist you want to cover all the gray, so she’ll use a permanent formula. Lightening up is a great way to soften grays, but if you don’t want to go blonde, try playing with highlights or lowlights, which hide the incoming grays while maintaining the illusion of dark hair, Miley says. For example, go with a dark base color and ask the colorist to add face-framing highlights that are just one to two levels lighter. Or try the opposite: Go with a dark blonde base, then ask your colorist to add darker pieces (a.k.a. lowlights) throughout. What can be done to keep grays aways between dye jobs? Maddeningly, grays can start showing as soon as a couple of weeks after coloring! If you (or your colorist) are already using permanent dye, you have a few options. The highlight/lowlight tricks mentioned earlier will help extend your color. If you dye at home, try a root touch-up kit between color sessions. Or mix up the formula you normally use and apply it to your roots only. Here’s the technique Rhys suggests: Divide your hair into four sections by parting it down the center from forehead to nape and then again from ear to ear. Starting with one of the back quadrants, take horizontal sections of hair and paint the color on only the new growth from the nape to the crown. Repeat with the other back section. Now move to the top of your head. Starting from just above the ear, take horizontal sections and paint color on your roots until you reach your center part. Repeat on your other side. Then cover the top of the bottle with plastic wrap, put the lid on it, and store it in your bathroom vanity until you need it again, Rhys advises. shades brighter than your hair color is most flattering. Otherwise, try a temporary fix. Tinted powders with hair-binding technology (meaning they stick to your strands) tend to work better than pencils and mascara-wand-like products, which can have less staying power. Unlike the touch-up kits mentioned above, these powders last only until you wash them out. One we like: Bumble and Bumble Hair Powder in Blondish and Brownish. In a pinch, just styling differently can hide roots on the rise. For starters, pump up the volume. “The more volume you put in the hair, the less gray you see,” says Miley. That’s because volume and texture draw the eye away from the telltale gray stripe. Spritz damp roots with a volumizing spray and blow-dry. Once dry, sprinkle on a body-boosting hair powder and massage into roots with your fingertips to add lift. You can also try a zigzag part-the regrowth will be less noticeable if there’s no focal point. I'm ready to go gray. How can I do it without looking terrible as my roots come in? The easiest fix is a considerable chop. The shorter you go (we’re talking pixie length), the quicker you’ll get rid of your dyed strands. If you don’t want to go that short, Miley suggests dyeing hair with a demi-permanent formula as you transition. Try Clairol Natural Instincts Crema Keratina. This type of dye blends the gray as opposed to completely covering it and lets the silver strands peek through (like adding more pepper to the salt). Makeup matters if you want to embrace your grays. Dust cheeks with a warm shade of blush so you don't look washed-out. "Peach is universally flattering and instantly peps up your complexion," says makeup artist Ashleigh Ciucci. Also experiment with the bold lip. "There's nothing more modern than a rich berry, brick, or cherry red," she says. “The color fades away; it doesn’t grow out,” Miley adds. Another solution is to have your colorist use multi-strength lighteners to extract the dye that’s currently in your hair, says John Gialluisi, creative director at Mario Tricoci Hair Salons & Day Spas in Illinois. A series of sessions may be necessary to achieve the transition to your natural gray; ask your colorist about bonding agents that can protect your hair throughout the process. I have silvery hair that's started looking dingy. How can I bring it back to life? You may lead a happily dye-free existence, but your gray strands still require maintenance. 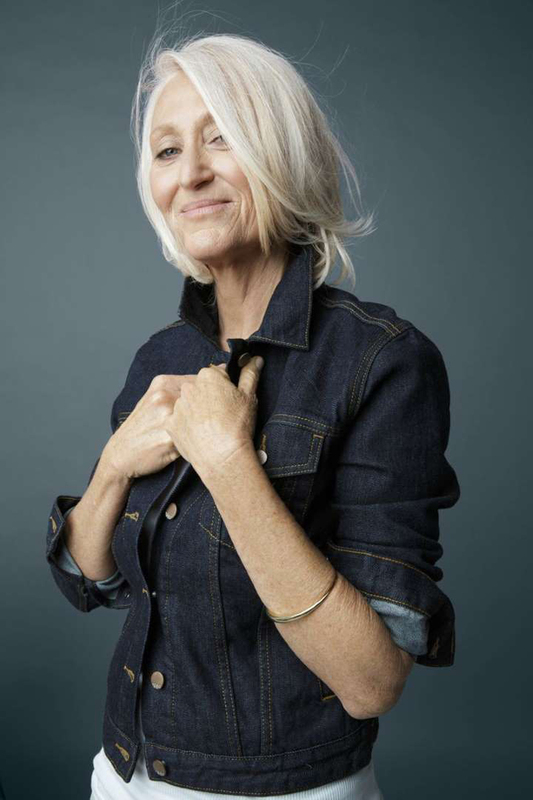 “Gray hair can take on a yellow tinge,” says Rhys. One fix is metallic blue color-depositing shampoo, as opposed to traditional blue-or-purple-tinted shampoos. “Shimmery blue undertones get rid of yellow brassiness, leaving hair brighter,” says Rhys. Why are my grays so coarse? Coarseness is a common complaint, but surprisingly, it's not directly related to the fact that your hair turned gray. "Losing pigment doesn't change the hair's structure," says dermatologist Melissa Piliang. 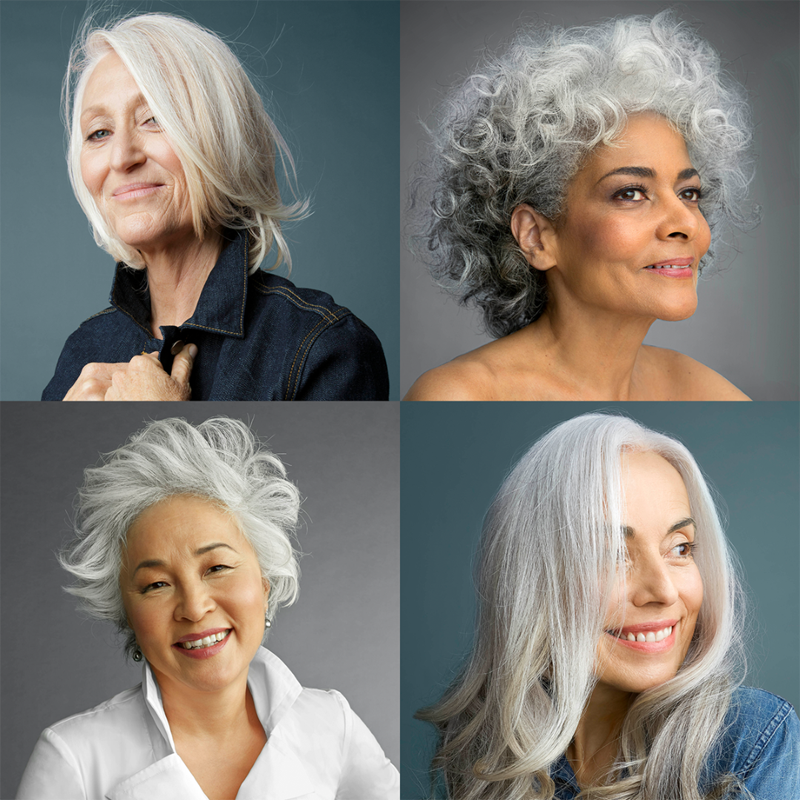 More likely: The same aging process that causes gray hair also causes your follicles to producer finer strands and your scalp to churn out less natural hair-smoothing oil. Says Piliang, "The combination of a thinner fiber, weaker cuticle, and less oil gives hair a rough, unruly texture"-so that's why those grays tend to stick straight up!-"which people may interpret as coarse." The result is more silver than gray. Use it once or twice a week instead of your regular formula. Coarser, drier hair may also appear frizzier and less light reflective, so maximizing shine is key. Do it with a structured haircut in a classic shape like a pixie, a bob, or a lob. Apply a high-shine serum or balm to damp hair before styling. We like Kenra Professional Color Charge Spray Serum. If you have wavy or curly hair, use the diffuser attachment as you blow-dry. For straight strands, use the nozzle. Both help direct the airflow so your strands’ cuticle layer stays smooth, which creates a shinier effect. Then use a boar-bristle brush while drying hair. Now, go gray your way!